The housing property market which also succumbed to the dampening impact of the global financial crisis may be showing some “green shoots” of recovery, especially in the medium-range landed housing sector. However, the high-end condominium market around the Kuala Lumpur City Centre vicinity is still fragile. Since the middle of this year, the take-up rate for landed housing units has improved and developers are seeing a return of buying interest for good projects in well sought after locations. Even the high-rise residential market is showing some glimmer of hope. The Malaysian Institute of Economic Research’s Residential Property Index (MIER RPI) hit 91.5 points in the second quarter of this year, which is a strong rebound from the all-time low of 69.3 points in the fourth quarter of 2008. As a sign of their improved confidence, more developers are lining up new greenfield projects for launch from the later part of this year. This is a much improved situation from late last year when things practically came to a halt and the sale registers at developers’ offices stopped ringing. Just when developers are about to look forward to brighter days ahead, the proposed reimposition of the real property gains tax (RPGT), albeit at a flat 5% rate irrespective of holding period and category of owners, is seen as a dampener of the “overall feel good” sentiment. Although some are not overly concern that the RPGT will slow down sales substantially, especially among first time buyers and owner occupiers, some say it will impact the investor market. Overall, with the prevailing low interest rates and improving economy, the environment is still relatively positive. IJM Land Bhd managing director Datuk Soam Heng Choon says with the current benign interest rates and the pent up demand due to lack of new launches in the last nine months, the sentiment should remain positive. “Most of our projected launches are on track and we will be putting more projects into the market. By our financial year ending March 2010, we would have launched about RM1.3bil worth of products nationwide,” Soam adds. Among IJM Land’s latest launches are the Nusa Duta project in Johor Baru in July and The Light Waterfront Penang in August. A new commercial project in Melaka will be launched next month. On challenges ahead, he says land prices are still on the rise and the cost of doing business remains high. “Industry players should take the lull period to improve their product delivery and refocus on quality products to lift the industry’s image in the years ahead,” Soam points out. Tan Sri Liew Kee Sin says developers are still careful with planning their launches. According to SP Setia Bhd president and chief executive officer Tan Sri Liew Kee Sin, the country’s economy is showing strong signs of recovery. Coupled with prevailing low interest rates and ample liquidity, the outlook looks more promising. Although sales is picking up, he says developers are still careful with planning their launches and only time will tell if the recovery is sustainable. Liew adds that product innovation which caters to the people’s changing lifestyle and needs will continue to fuel demand, adding that the company will continue with its launches in its townships in Johor, the Klang Valley and Penang. Mah Sing Group Bhd group chief executive Tan Sri Leong Hoy Kum says: “The market is gaining momentum for an up cycle in the second half of 2010. The company is lining up some new project launches next year, including Garden Residence in Cyberjaya by the first quarter of 2010. The project has received more than 600 registrants so far for the superlink homes and semi detached houses. Mah Sing is also planning to launch the iParc project in Bukit Jelutong comprising semi-detached factories with flexible layouts for corporate warehousing. Leong says as property demand in the country is largely driven by fundamentals, there has been no price bubble so far and hence, any downside for property prices is limited. As of the middle of July, Mah Sing achieved RM543mil in sales, exceeding the full year target of RM453mil. Its unbilled sales stood at RM812mil, approximately 1.6 times the revenue recognised from the property division last year. Hunza Properties Bhd executive chairman Datuk Khor Teng Tong says prevailing low interest rates, a growing population, relatively low unemployment, and no significant overbuilding are strong factors to fuel growth in the market. Industry players should also be well versed with the industry cycles, trends and changing needs of the society. Concurring with him, Gamuda Land Sdn Bhd managing director Chow Chee Wah says innovative master plans with strong concept, good systematic implementation and execution will result in quality delivery system. “Projects by developers with strong track record, good capital appreciation and rental yields will continue to do well even during difficult economic times,” he says. Chow says to ensure more sustainable growth, it is necessary to maintain the current financing rates. “To provide a further lift to the property market, it is important to liberalise the bumiputra quota issue and state consent on purchase of leasehold property. “Streamlining the process to cut down red tapes for speedier approvals in the two areas will be great help to the property industry,” he says. Will the 5% real property gains tax be a deterrent? AS the property investor goes through his checklist on why he should invest in Malaysia, that 5% real property gains tax (RPGT), to be effective Jan 1 next year, will be a bit of a blemish. Although it is just 5%, it raises a hypothetical question. Will this 5% be raised sometime down the road? The Government gave an exemption in April 2007 to stimulate the market when it was already quite hot. It boosted the market and coupled with the iconic location of KLCC that was then emerging at that time on the world property market scene, foreigners and locals bought into that location. The Kuala Lumpur property scene was seen as lagging in terms of prices to the regional markets. It still is. A lawyer who declined to be named said the RPGT, with its graduating scale of 0%, if a property is sold after five years, to 30% if sold in the first two years, was never abolished. Her remark two years ago: the Government can always bring it back, in different forms. That time has come. 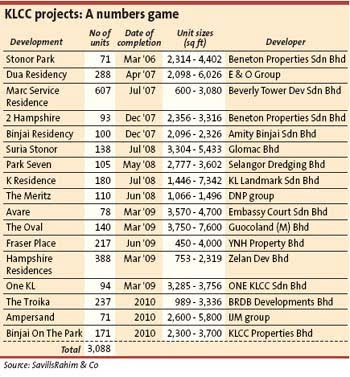 With the pressure building up in the high-end condominium market in the Kuala Lumpur City Centre (KLCC) and its vicinity as more projects are completed, that re-instatement could not have come at a more inopportune time. There is an existing supply of about 5,700 units and a further 5,800 units are expected to come onstream in the next two to three years. (See the table on KLCC projects). The pressure is coming from two counts – prices and rental. Its effect will be felt by both owners and developers who have not sold all their units in that iconic and surrounding vicinity. Savills Rahim & Co MD Robert Ang says the market is on the downtrend and it is clear that there will be an oversupply as the year comes to an end and 2010 rounds the corner. “My KLCC condominium sales are not registering a boom. It is at a standstill,” he says. The situation is expected to lumber along like this for the next six months to one year. Even at RM950 per sq ft, compared to a high of RM1,200 to RM1,500 per sq ft, it is a challenge to sell in today’s market. An expatriate owner called to sell her condominium for between RM1,200 and RM1,400 per sq ft.
“I told her I cannot perform a miracle. She bought into that project at between RM600 and RM700 per sq ft,” he says. As more units enter the market, and the Jan 1 deadline rounds the corner, buyers will try to bargain down further. “This will move Malaysia a step back in terms of overall attractiveness in the regional investment market,” says Regroup Associates executive director Paul Khong. This is another layer of tax the investor has to consider when they invest and/or decide to liquidate. Any purchaser irrespective of whether local or foreign will have to weigh this accordingly in their investment consideration. Owners who are in the selling mode will try to beat the deadline, while buyers will try to squeeze in a further discount because of the Jan 1 deadline. It is too early to see the impact of that 5% tax but it is a psychological barrier, particularly for those who entered that market in 2006/07 when it was at its peak. Some of them will not be making money and they are already upset. With this flip-flop policy, they may just take their money and go elsewhere to get a better return. For those who bought in the early days at RM500 to RM600 per sq ft, that 5% is just a dent. Which is why when it comes to investing in properties, it is always a question of timing and location. About 20% to 40% of owners are foreigners. If the project is marketed locally, the foreigner content is only about 10% to 15% and if an international roadshow is done, the percentage doubles, Khong says. At the moment the foreigners are largely Asian investors. “After the third quarter of 2008, buyers have been largely locals but that number is shrinking as well,” says Khong. Generally, buyers bought into that market for rental and capital appreciation due to the uniqueness of that location and the Petronas Twin Towers. It is liken to Hyde Park of London and Central Park, New York. Ironically, there isn’t a Petronas Twin Towers or a central park in Singapore, yet prices are chugging along over there, which takes us to the rental dynamics here, or lack of it. Khong & Jaafar Sdn Bhd managing director Elvin Fernandez says those who bought into KLCC and its vicinity will want a net yield of between 5% and 6%. There have been arguments that people who buy into that location do not care about rental yield. He does not buy that. People with money have alternative uses for their funds. If a buyer bought a 2,400 sq ft unit at RM1,500 per sq ft (RM3.6mil) and rents it out at RM5 psf (which is between RM4.50 and RM5 today), he would get RM12,000 monthly rental, or RM144,000 a year. He has to less the outgoing expenses of about 75 sen psf for the quit rent, assessement and service charges, which comes up to RM21,600 a year. 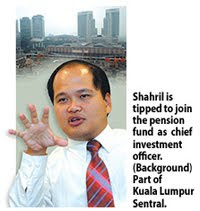 So he makes RM122,400 a year (3.4% net). If it were a landed property, he may be quite happy but not for a condominium. Value in that location have been running up ahead of supportable rental, which is why as soon as the crisis came, the market shook. If he wants to get a rental return of 5.8%, he will have to rent at RM8.50 per sq ft. That is impossible in today’s market, Fernandez says. Malaysians will not want to pay that sort of rental, which means owners are looking at the expatriate community. But the foreigners who arrive on Malaysian shores do not command that sort of monthly rental expenses from their employers. In Singapore, an expatriate may get a monthly rental allowance of S$30,000. That is why prices can go up so high. Henry Butcher’s COO Tang Chee Meng says Malaysia is not attracting enough of that level of expatriates whose rental allowance average RM15,000 to RM20,000 a month, and even less of those who command between RM30,000 and RM40,000 a month. “They send these people to Singapore and Hong Kong, the big financial centres of Asia,” says Tang. Rental yield aside, the second weakness in that market is the sizes of the units, which are generally more than 2,000 sq ft. In Singapore today, developers are cutting it small. Agents contacted say there is interest in the smaller units. With companies around the world cutting cost and sending less manpower abroad, the larger units will be difficult to fill, and to sell. For developers who have unsold stocks, they may try to promote their projects abroad. No story on the KLCC property outlook may be complete without a mention on Binjai On The Park, which sets the benchmark in that location. Even in that high-end location, they are the average priced units and the super class condominium. Binjai On Park belongs to the super class. Early this year, it was going for RM2,400 per sq ft. At its peak, prices went as high as RM3,500 per sq ft. As it nears completion, it is unlikely Malaysia’s premier company Petronas will allow that project to be shrouded in darkness, as with many of today’s projects in that iconic location when night falls. Watch that space. TA Global Bhd, which will rank as the country's fifth biggest listed property group in terms of market value, has lined up around RM7 billion worth of property development projects locally, to be launched over the next two years. Director Datin Alicia Tiah said three projects will be launched in the second half of next year. They are Dutamas in Mont' Kiara, U-Thant 28 in Ampang and Seri Suria, a mix development in Sri Damansara. By 2011, the group plans to launch Nova Square at the junction of Jalan Bukit Bintang and Jalan Imbi, and two 50-storey residences near the Petronas Twin Towers, in Kuala Lumpur. Nova Square features an office tower, a serviced apartment block, a five-star hotel carrying the Aava brand, and a podium for boutique shops. Tiah said the development order has been approved for Nova Square and it will be submitting its building plans soon. "We will take a year to lay the foundation. Construction would take another three years. We are confident of selling the property due to its location. We will, however, retain the hotel, a few apartments and the podium for recurring income," she added. Tiah said she expects TA Global to maintain its profits in the current financial year ending January 31 2010 and in 2011. But revenue may dip due to fewer launches. "We expect higher margins from our overseas investment properties, thanks to foreign exchange gain. Locally, we sold many high margin products and the profits would be recognised over the next few quarters," she said. Last year, TA Global made a net profit of RM92.9 million on a revenue of RM441 million. "If things go well and we get faster approvals for our projects, TA Global may surpass the RM93 million in fiscal 2011," she said at the launch of TA Global's prospectus in Kuala Lumpur yesterday. TA Global is due to list on the Main Market of Bursa Malaysia on November 23. Its parent, TA Enterprise Bhd (TAE) is looking to raise RM230 million from the listing. Tiah, who is TAE co-founder and managing director, said it will use the proceeds to pare down debt and for working capital to expand its financial services. TAE folded all its property assets into TA Global to "unlock the hidden value". The initial public offering entails 460 million ordinary shares of RM0.50 each at an offer price of RM0.50 apiece. It will offer 360 million shares for private placement to selected Bumiputera institutions and investors, and 90 million shares to Bumiputera citizens, companies, societies, cooperatives and institutions by way of balloting. Some 10 million shares will be issued to eligible directors and employees of the company. TAE will retain a 57 per cent stake in TA Global after the listing, while TA Global executive chairman Datuk Tony Tiah Thee Kian will hold 8.1 per cent. In addition, TA Global, which has total assets valued at RM2.4 billion, will raise RM135 million via a rights issue. Proceeds from the rights issue will be used to renovate its Aava Whistler Hotel in Canada, acquire more assets and undertake new developments. KUALA LUMPUR: TA Global Bhd, slated for a listing on the Bursa Malaysia main market on Nov 23, is keen to acquire more properties locally and internationally. Director Datin Alicia Tiah said TA Global already had properties in Australia and Canada. The company’s existing portfolio includes two five-star hotels in Australia and a four-star hotel in Vancouver, Canada. “We’re always looking for opportunities. Buying a hotel is not as easy and a lot of homework needs to be done. We want to buy properties that have the right location, price as well as offer good yields,” Alicia said after the launching of the company’s prospectus yesterday. She said the company was not under pressure to buy anything at the moment but would consider it if something came along. To a question, Alicia said she hoped TA Global would have some “good news from Canada to disclose soon”. Going forward, Alicia expects revenue from its hospitality division to triple in the financial year ending Jan 31 (FY10). Alicia said hypothetically, revenues from hospitality should increase judging by the number of hotels it had now from one previously. On pro-forma basis, TA Global posted a net profit of RM92.8mil on revenue of RM440.7mil in FY09. For the three months ended April 30, its net profit fell to RM15.7mil from RM19.8mil previously. Revenue was also lower at RM49.2mil. “I’m sorry. We’re not allowed to give forecast but we’ve been profitable over the last three years,” Alicia said when asked on the company’s financial performance. However, she expects the company to “maintain” its financial performance in FY10 and FY11. On the local front, TA Global owns land in prime areas in the Klang Valley. Its head office, Menara TA One, is scheduled for refurbishment and when completed, is expected to see higher yield. With the listing, TA Global is expected to be one of the largest listed property companies in the country. The exercise includes a rights issue of 269.9 million new shares to its single-largest shareholder TA Enterprise Bhd (TAE) at an issue price of 50 sen, raising RM135mil, which will accrue to TA Global. TAE will offer for sale up to 460 million TA Global shares at an indicative offer price of 50 sen each. Of the total, 90 million shares are allocated for bumiputra individuals and organisations. Another 360 million shares are for approved bumiputra investors and 10 million shares for eligible directors, employees and business associates of the TA group. The listing exercise is expected to raise RM230mil. The proposed reimposition of the real property gains tax (RPGT) come Jan 1 has ruffled feathers among property investors and industry players with calls made for its review before being implemented. Depending on whether you own just “the roof over your head” or have a nest of property assets, the concern from various quarters largely centres on the fact that a flat rate of 5% will be imposed on all gains from disposal of real property irrespective of the holding period and category of owner. To ensure the tax will be equitable and acceptable to all, there is a need for further fine-tuning before its implementation. Prior to the exemption of the RPGT in April 2007, tax on gains from property disposal was on a progressive basis from 30% to 0% depending on the holding period of the property. Long-term property investors and owners who have held on to their properties for many years or decades are particularly spooked by the proposed 5% tax rate. Firstly, their contention is that they should not be the target group of the RPGT when the intention of the tax is to reign in speculation in the property market in the first place. After all, they are not speculators and have dutifully held on to their property which in a way has contributed to the market’s growth over the years. They don’t see the logic of having to pay tax for the “gains” they will make if they decide to sell their property one day, especially when there is no explanation on how the “gains” will be calculated. It will be unfair to just base the calculation on the sale price minus purchase price when the value of the ringgit has not been duly adjusted. The time value of money should be considered and there should be an equitable formula used to calculate the actual value of the “gains” if the tax is to be imposed. We have to bear in mind that the value of the ringgit when the property was first purchased in the past was many times higher than the value today. There should also be a cut-off time for the holding period after the fifth year as imposing a flat tax rate of 5% irrespective of number of years of acquisition is punitive to owners who may have bought their properties many years ago. What if after holding the property over a period of time, the owner decides to move into a better property or to relocate to another place? Some also voice concern that extending the tax on long-term property owners will be like imposing a capital gains tax on them when there is no tax on gains made from equity trading. Another concern is the timing of the implementation. Reinstating the tax at this juncture when the local property market is just recovering from the global financial crisis may be untimely. Although sales have picked up since the middle of the year, this was mainly due to the many housing packages and easy financing facilities offered by developers and financial institutions. It will be a better gauge to see if sales will continue to hold once those packages expire around year-end. Perhaps the soonest time to reinstate the RPGT will be the middle of 2010 when there is more certainty on whether the economic recovery is sustainable or that it will head for another dip or a “W” recovery. And instead of the proposed flat 5% that will also penalise long-term owners, it will be a better alternative to impose a higher tax rate on those who make high profit from disposing of their property within the first two to three years of purchase. That will be more effective in preventing overheating and bubbles from forming and ensure a more balanced long-term growth. Deputy news editor Angie Ng believes companies making huge profit margins, especially providers of consumer services including telcos and banks, should contribute towards a corporate responsibility fund for more social-oriented projects for the people. ISKANDAR Investment Bhd (IIB), the catalytic developer of Iskandar Malaysia in Johor, is expected to reveal numerous investments in the south economic region over the next few months. "We continue to have growing interest from potential investors worldwide, who see potential in Iskandar Malaysia," said Khazanah Nasional Bhd managing director Tan Sri Azman Mokhtar. IIB, a unit controlled by the state-owned Khazanah, is on track to surpass the US$13 billion (RM43.94 billion) foreign direct investment target for its first phase of development. Yesterday, Education@Iskandar Sdn Bhd, a subsidiary of IIB, signed a landmark agreement to develop Marlborough College Malaysia, as part of a long-term plan to establish EduCity - located within Iskandar Malaysia - as a world-class education hub. The signing was witnessed by Deputy Prime Minister Tan Sri Muhyiddin Yassin, who is also Education Minister. "Malaysia is an emerging contender to attract international students and the agreement between Iskandar Investment and Marlborough College is testament that we are moving in the right direction to become a global education hub in Asia," Muhyiddin said. There are some 16,000 international students studying in private and international schools in Malaysia. Marlborough College Malaysia is the first international venture for the leading British independent, co-educational boarding school for pupils aged between 13 and 18. Expected to open in September 2012, Marlborough College Malaysia will provide first class education to local and international students across Asia. Its 36.42ha campus here will see initial intake of 350 students in June 2012, with enrolment projected to increase gradually to up to 1,300 students in 2020. Marlborough College Malaysia will boost economic growth in Iskandar Malaysia with the creation of over 340 job openings for academic and non-academic staff, with additional employment and business opportunities in the future. The entry of one of UK's leading independent co-educational boarding schools follows investments from other education groups such as Newcastle University Medical Malaysia, which is due to open its campus in 2011. IIB also recently inked an agreement with De Ruyter Maritime Institute and Willem Barentsz Maritime Institute to set up a Dutch Maritime University at EduCity. Other institutions IIB is looking to bring in include skilled training institutions, international schools, research and development facilities and regional training centres. PUTRAJAYA: Iskandar Investment Bhd (IIB) hopes to announce numerous agreements on investments in Iskandar Malaysia over the next few months as there is growing interest in the economic zone from potential investors globally. IIB is an investment holding company working in close partnership with the Iskandar Regional Development Authority to attract investments to Iskandar Malaysia. “This is testament that Malaysia is seriously competing in the global marketplace and meeting with ongoing success despite the prevailing economic situation,” said chairman Tan Sri Azman Mokthar, who is also managing director of Khazanah Nasional Bhd, the government’s investment arm. Speaking at an agreement signing between Education Iskandar Sdn Bhd, Marlborough Overseas Ltd and M East Sdn Bhd here yesterday, Azman said to increase Iskandar ’s profile as a “thriving, international urban centre”, efforts were being put in place to increase the overall accessibility of the special economic region. This would be done via the building of new infrastructure such as highways and so on, he added. Yesterday’s agreement will see the establishment of Marlborough College Malaysia in Iskandar, the country’s first economic growth corridor which was launched in 2006. Education Iskandar is a subsidiary of IIB while M East is a special purpose vehicle set up to develop this project. The setting up of the institution is also the first international expansion of the co-educational British boarding school. Marlborough College Malaysia, to be opened by September 2012, is expected to create over 340 job opportunities for academic and non-academic staff with additional employment and business opportunities in the future. The school will cater to students between the ages of five and 18. “Education is a key pillar of growth for the region and our long-term objective is to create a world class education hub here in Iskandar Malaysia,” Azman said. He declined to reveal the value of investment of the college, saying that “announcements would be made in due course”. Tan Sri Liew Kee Sin (second from left) exchanging documents with Hangzhou Ju Shen Construction Engineering chairman Hu Bai Fu, witnessed by Datuk Seri Kong Cho Ha (centre). With them are Setia Land (China) Ltd chairman Datuk Beh Hang Kong (left) and Hangzhou Ju Shen business development advisor Xu Yong. SHAH ALAM: SP Setia Bhd, which has secured its first property project in Hangzhou, China, with a gross development value (GDV) of RM2bil, aims to derive 30% of its revenue and net profit from overseas projects by 2014. Currently, overseas projects contribute less than 5% to the company’s revenue. President and chief executive officer Tan Sri Liew Kee Sin said the China project, which comprises residential and commercial buildings including a hotel, would be developed in four phases over five years. “The first phase, with a GDV of RM500mil, will commence early next year and should take about 2½ years to complete,” he said yesterday. Liew said this after a joint-venture contract signing ceremony between SP Setia and Hangzhou Ju Shen Construction Engineering Ltd, its local partner in China. Under the contract, a joint-venture company – Setia Fusheng Property Development Co Ltd – would be formed to undertake the project on 24 acres, with SP Setia having a 55% stake. Liew said the partnership was akin to a perfect marriage, as both companies shared the same aspirations and values in terms of property development. “SP Setia will provide the expertise and funds, while our China partner will inject the land,” he said, adding that this could fast track SP Setia’s expansion into the republic. Liew said SP Setia chose Hangzhou for its first flagship project because the place had many strong points, including a population of nine million, an international airport close by and was fast growing into a commercial hub. “This is our second venture abroad after Vietnam and SP Setia expects property projects in China to contribute significantly to its bottomline in the future,” he said. Housing and Local Government Minister Datuk Seri Kong Cho Ha, who witnessed the ceremony, said first-time home buyers (foreign or local) were exempted from tax on capital gain if their properties were proven to be their principal home of residence under the Income Tax Law. SP SETIA Bhd, the country's biggest property developer, will develop a RM2 billion mixed development project in XiaoShan, Hangzhou City in China, scheduled to begin in the first quarter of 2010. This will be SP Setia's maiden project in China, in a joint venture (JV) with Chinese landowner, Hangzhou Ju Shen Construction Engineering Ltd (HJSCEL). SP Setia, through its subsidiary Setia (Hangzhou) Development Co Ltd, holds a 55 per cent stake in the JV, while HJSCEL has a 45 per cent stake. Work on the 10ha project will be completed in four phases over five years. It features 11 residential towers, five office blocks, serviced apartments, a four-star hotel, a 300,000 sq ft retail mall and signature shops, said SP Setia president and chief executive officer Tan Sri Liew Kee Sin. "We are awaiting for approvals from the Chinese authorities. We hope to get them by early 2010 and start Phase 1 of the project immediately," he said after the signing of the JV agreement with HJSCEL in Shah Alam, Selangor, yesterday. The event was witnessed by Housing and Local Government Minister Datuk Kong Cho Ha. "Phase 1 includes commercial properties and service apartments worth RM500 million," Liew said. "We are not looking at borrowings as it is a self-funded project. We are developing the properties on a sell-and-build concept," he added. However, it will retain the mall to control its tenant mix. The service apartments will be pegged at RM400-RM500 per sq ft, while the commercial properties will go for RM500 per sq ft onwards. "Our first income from this project will come in two years. The project will contribute positively to the future earnings and cash flow of SP Setia. It will also tell the world that we are ready to be an international property player," Liew said. Liew said SP Setia is in talks with other landowners in China to form JVs, with priority to develop in Hangzhou. He added that the company has a five-year plan to get 30 per cent of its net profit and revenue from overseas projects by 2014, from 2-3 per cent currently. "We will focus on Vietnam and China for the next few years." Mutiara Goodyear Development Bhd, a mid-sized property developer, plans to launch RM1.5 billion worth of residential and commercial properties in the Klang Valley and Penang over the next year. The properties will be divided into seven launches, starting from next month until the end of 2010. "We are ready to launch the properties, but as to when, we will have to assess the market," its executive chairman Hamidon Abdullah told reporters after the company's annual general meeting and extraordinary general meeting in Kuala Lumpur yesterday. "The approval and finances are in place," Hamidon said. "The launches will start from next month onwards and will keep us busy until the end of next year," he added. Its chief executive officer Kee Cheng Teik said the projects are being spread out so that the company can manage them well. "In fact, we were ready to be put up (the properties) in the market last year, but had to delay them (due to the economic slowdown)," he said. In its annual report 2009, Mutiara Goodyear said it plans to build 142 units of high-end bungalows and 46 units of superlink homes in Taman Melawati, Ampang. It is also developing Mutiara Kajang project in Kajang, Selangor that features 392 units of bungalows, link houses, superlink homes and semi-detached homes. Additionally, Mutiara Goodyear has teamed up with Tambun Indah Sdn Bhd to embark on a 101.48ha residential development project in Seberang Prai, Penang. Meanwhile, the company is looking to acquire more land to add to its existing 356ha of landbank in the Klang Valley and Penang. For the financial year ended April 13 2009, Mutiara Goodyear posted a net profit of RM17.39 million on revenue of RM91.3 million. KUALA LUMPUR: Mutiara Goodyear Development Bhd believes the Government’s proposal to reimpose the 5% real property gains tax (RPGT) from Jan 1 next year will give certainty and market clarity to the property industry. Chief executive officer Kee Cheng Teik said these values were important especially for potential foreign investors. “It (the RPGT) was temporary waived but is now going to be tabled and this will give a clear picture to potential investors. Plus, the 5% figure is not really big,” he told a press conference after the company AGM yesterday. He also said the RPGT was not going to give much impact to the company as its buyers were mostly resident-owners rather than investors. It was reported that under Budget 2010, the RPGT would be imposed on gains from the disposal of real property irrespective of the holding period and category of owner. Prior to the exemption of the RPGT in April 2007, tax on gains from property sales was on a progressive basis from 0% to 30%, depending on the holding period of the property. On the performance of the company, Kee said Mutiara would launch RM1.5bil worth of properties starting next month until the end of next year. “The launches will be mixed developments that are mostly residential. Five projects will be in the Klang Valley and two in Penang. However, the launching dates will depend on the timing factor and market conditions,” he said. Kee said the company had an undeveloped land bank of about 890 acres with future gross development value of about RM4.2bil. Executive chairman Hamidon Abdullah said it was important for the company to come up with products that really suited the demand and needs of buyers at this time of uncertainty. The heritage enclave of George Town in Penang may see a waterfront development soon. It is learnt that YTL Corp Bhd will embark on a project, through joint-venture company PDC Heritage Hotel Sdn Bhd, to build luxurious condominiums and an eatery on a 1.4ha seafront site adjacent to the 124-year-old Eastern and Oriental (E&O) Hotel along Lebuh Farqhuar. PDC Heritage was set up about a decade ago, with YTL Corp holding 51 per cent stake and Penang Development Corp (PDC) the remaining 49 per cent. It is not known if PDC has since divested its interest in the joint-venture company. According to sources, the project will feature six blocks of high-end condominiums. A double-storey building housing food and beverage outlets will also be built on the site where two dilapidated heritage structures are currently standing. However, the development value of the proposed project is not known. Local authorities gave PDC Heritage approval in June this year to convert its prime seafront land from leasehold to freehold status. The land, bordered by the E&O Hotel and St Xavier's Institution, was originally state-owned and had nine pre-war buildings. In 1996, the land on which sat government staff quarters, the former Public Works Department district engineering office, watchman's quarters and a garage, was alienated to PDC. In 1998, PDC came under fire from heritage activitists when it demolished the 80-year-old buildings without local council approval to make way for a five-star hotel, which was to be developed by PDC Heritage Hotel. YTL Corp group managing director Tan Sri Francis Yeoh could not be reached for comment. PUTRAJAYA: WCT Bhd and Iskandar Investment Bhd (IIB) will jointly develop and own a residential project in Iskandar Malaysia, the 1Medini, with a gross development value of RM600mil. 1Medini comprises 1,332 condominiums and 68,800-sq-ft commercial space in the 2,300-acre Medini, a mixed urban development alongside Legoland Malaysia, Educity and the Iskandar financial district. WCT chairman Datuk Capt Ahmad Sufian said a joint-venture company, One Medini Sdn Bhd, had been set up to undertake the development, which was 70% owned by WCT Land Sdn Bhd and 30% by Medini Land Sdn Bhd. WCT Land and Medini Land are wholly-owned subsidiaries of WCT and IIB respectively. “We were also awarded a RM766mil contract for infrastructure works for the whole of Medini in July,” he said after a strategic partnership signing ceremony between WCT Land and Medini Land for the 1Medini development. The event was witnessed by Johor Mentri Besar Datuk Abdul Ghani Othman. IIB chief executive Arlida Ariff said phase one of 1Medini was scheduled to be handed over to buyers in early 2011 and its full completion was expected in 2015. She said that so far, the response had been quite good with interested buyers from the Middle East, Indonesia, Singapore as well as locally. Ahmad Sufian said the Medini projects were expected to contribute positively to WCT’s earnings from the next financial year ending Dec 31, 2010 and should last for three to four years. WCT Bhd and Iskandar Investment Bhd will jointly develop and co-own the 4.4-hectare 1Medini residential project in Medini Iskandar, Johor with a gross development value (GDV) of RM600 million. The project will be developed by One Medini Sdn Bhd, a 70:30 per cent joint venture between WCT’s subsidiary, WCT Land Sdn Bhd and Medini Land Sdn Bhd, a subsidiary of Iskandar Investment. Scheduled to be fully completed by 2015, the 1,332 units of condominiums in 1Medini would include a 68,800 sq ft commercial area for local retail businesses. Priced at RM350 per sq ft, the first phase of the condominium is expected to be launched in early 2012. PETALING JAYA: Mah Sing Group Bhd posted a net profit of RM23.5mil in the third quarter ended Sept 30, a 42% improvement from the previous corresponding period. The higher profit was contributed by its current residential and commercial projects. However, its revenue for the quarter dropped 17.5% to RM135.14mil. In a filing with Bursa Malaysia, Mah Sing said its plastics division also contributed to the earnings apart from property development, adding that the latter contributed more than 90% to its operating profit. “The group’s quick turnaround business model has generated healthy profit and cashflow with about RM120.4mil cash as at Sept 30,” it said. The company yesterday acquired two pieces of prime land in Selayang and Petaling Jaya that could yield an estimated total gross development value of RM1.05bil. Its wholly-owned subsidiary, Nova Century Sdn Bhd, acquired about 26 acres of freehold development land in Selayang for RM41.65mil cash. Meanwhile, its other wholly-owned unit, Sierra Peninsular Development Sdn Bhd, acquired about 19.6 acres in Petaling Jaya for RM89mil. Mah Sing has also announced that it proposed to undertake a share private placement and bonus issue that could potentially raise gross proceeds of RM103mil. The private placement involves 63 million new 50 sen shares, representing about 10% of its issued and paid-up capital. The one-for-five proposed bonus issue involves up to 151,286,435 new shares. The private placement and bonus issue are targeted for completion by year-end and the first quarter next year respectively. Property developer Mah Sing Group Bhd is buying two plots of land worth a combined RM927 million in Selangor, it told Bursa Malaysia yesterday. It plans to develop the two plots, a 10.53ha land in Selayang and a 7.938ha land in Petaling Jaya, for residential and commercial purposes respectively. Mah Sing also proposed a private placement of up to 63 million new shares, about 10 per cent of its paid-up share capital. The placement will be done in several tranches and the issue price will be at a discount of not more than 10 per cent based on the five-day weighted average market price of the share or the par value of 50 sen each share. Proceeds will be used to strengthen its financial position and reduce borrowings. The company also proposed a bonus issue of up to 151.3 million new shares on the basis of one bonus share for every five shares held. Mah Sing Group Bhd, Malaysia’s fifth-biggest property developer, rose the most in almost three months after the company said third-quarter profit jumped 42 per cent and it announced land acquisitions and a bonus issue. The shares climbed 3.4 per cent to RM1.84 ringgit at 9:56 a.m. local time, headed for their steepest gain since Aug 6. The stock is set be the best performer on the FTSE Bursa Malaysia Top 100 Index, which fell 0.8 per cent. Mah Sing is benefiting from an economic recovery spurred by the government’s RM67 billion (US$19 billion) of stimulus initiatives. The company yesterday acquired 46 acres of land with plans to develop RM1.05 billion of homes and offices. Profit climbed to RM23.5 million in the third quarter from RM16.5 million a year earlier, boosted by higher sales, it said. Mah Sing said it plans a one-for-five bonus share issue. The company also proposed a private placement to raise RM103 million for working capital, it said in a statement yesterday. It’s “perfect timing to build its land bank and war chest,” Kenanga Investment Bank Bhd said in a report today. Kenanga raised its target price on Mah Sing to RM2.36 from RM2.33 and maintained its “buy” rating. Mah Sing has been “on a roll” in terms of buying land this year, having spent RM289 million on 180 acres, CIMB’s Wong said. The land has a combined gross development value of RM1.9 billion, he said. Mah Sing Group Bhd, Malaysia’s fifth-biggest property developer, had 12.5 million shares worth RM23.1 million changing hands in an off-market trade. The shares traded off-market at RM1.85 each, according to stock exchange data. Boutique property developer Kuala Lumpur Metro Group will launch two resort developments and a housing project worth a combined RM300 million in Port Dickson, Bangi, and Penang, over the next eight months. 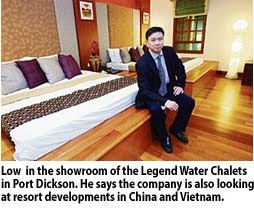 The low-profile group, which made a mark in property development when it launched its landmark project - the Legend International Water Homes in Port Dickson in 2003, is also planning to expand into China and Vietnam. "We are looking at resort developments in China and Vietnam. We believe there is a market for resort-type products. We have identified the local partners, but plans are still preliminary," said KL Metro managing director Datuk Low Tak Fatt. Locally, KL Metro will launch Phase 3 of the Legend Water Homes valued at RM45 million and 30 units of semi-detached houses in Bangi, worth RM25 million, by December. 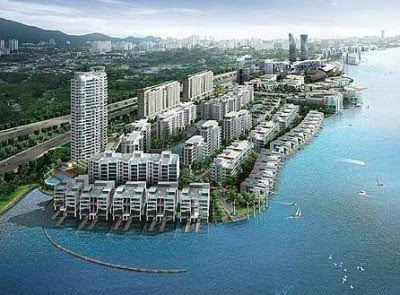 By mid-2010, KL Metro will launch The Hibiscus in Penang, which features 460 units of five-star water homes at Teluk Kumbar. The Penang development is worth some RM200 million and KL Metro is targeting buyers from Asia Pacific, Europe and the Middle East. "Demand for water homes in Malaysia is greater than supply so we expect our projects to do very well," Low told a media briefing on the second phase of its Legend Water Homes in Kuala Lumpur yesterday. Phase 2, which will open on November 1, offers 166 water homes, 44 garden chalets and 39 sky pool villas. Priced from RM400,000 to RM700,000 each, some RM160 million or 99 per cent of the properties have been sold, Low said. Majority of the buyers were from the Hong Kong, Singapore, Macau, the Middle East and some European countries, with an option to lease back at an 8 per cent gross rental income return a year. Low said he expects 50 per cent occupancy in the first year, with average promotional room rates starting from RM550 per night to RM900. He said KL Metro is aiming for occupancy to grow by 10 per cent per year via aggressive marketing. "Despite the downturn of the economy and credit crunch worldwide, we still managed to complete Phase 2 three months ahead and sell all the units. We are proud of this development," Low said. Phase 1, which has 329 units, was completed in 2006 and fully sold within two years. The Balinese-themed resort took the "Best Architecture" and "Best Development" titles at the CNBC International Property Awards in London in 2007. The project will be developed by One Medini Sdn Bhd, a 70:30 per cent joint venture between WCT's subsidiary, WCT Land Sdn Bhd and Medini Land Sdn Bhd, a subsidiary of Iskandar Investment. WCT chairman Datuk Captain Ahmad Sufian attributed the involvement of the company in the 1Medini project as a bonus because WCT had already awarded RM766 million worth of infrastructure works in Medini Iskandar in July this year, where works are expected to be completed by July 2011. "We are proud indeed to be given this golden opportunity to make our first foray into the Iskandar Malaysia via the Medini Iskandar project and hope to expand our investment here," he told reporters after the signing of shareholder agreement for the development of 1Medini residence between WCT Land and MediniLand, in Putrajaya today. Ahmad said the WCT also wanted to further grow its business in Malaysia and would continue to bid for any projects locally as well as international. Its order book currently stands at RM3.5 billion. In 2008, local operations contributed 40 per cent to the group's revenue while the balance of 60 per cent came from the overseas market. The construction and property development company currently has presence in United Arab Emirates, Qatar, Bahrain, Oman, India and Vietnam. Scheduled to be fully completed by 2015, the 1,332 units of condominiums in1Medini would include a 68,800 square feet commercial area for local retail businesses. Priced at RM350 per square feet, the first phase of the condominium is expected to be launched in early 2012. Iskandar Investment president and chief executive officer, Arlida Ariff, meanwhile, said the strategic partnership with WCT in 1Medini project would help to meet the increasing demand for quality homes as well as to attract talented global citizens to live, work and play in Iskandar Malaysia. There has been interest from both Indonesians and Singaporeans, she said. According to the Iskandar Regional Development Authority (IRDA), Iskandar Malaysia has over RM47 billion in committed funds from the government bodies and international investors to date. PETALING JAYA: Sunway City Bhd (Suncity) has teamed up with Sino-Singapore Tianjin Eco-City Investment and Development Co Ltd (SSTEC) for a project in Tianjin Eco-City, China, which an estimated gross development value worth more than RM2.48bil. SSTEC is a 50:50 joint venture between a Chinese consortium led by Tianjin TEDA Investment Holding Co Ltd and a Singapore consortium led by Keppel Group. Sunway group chairman Tan Sri Jeffrey Cheah said a memorandum of understanding had been signed between the two parties to conduct market research and a feasibility study. six months,” he told reporters yesterday. The second-phase development of the project will be a mixed-development project constituting 88% residential and 12% commercial properties, with construction expected to begin from 2011. The project is Suncity’s biggest in China. The Tianjin Eco-City is a landmark bilateral project between China and Singapore. Located in the Tianjin Binhai New Area, the 30 sq km Tianjin Eco-City will be a modern township where 350,000 people will live. Separately, Cheah said Sunway Holdings Bhd would rely on its own reserves to fund its Singapore joint-venture condo project with Hoi Hup Realty Pte Ltd.
“The company has enough funds to proceed with the 400 to 500 condo units there,” he said, adding that Sunway would have a 30% stake in the venture. The project, which has a gross development value of S$435mil, covers 207,000 sq ft at Jalan Senang and Lengkong Tujoh off Sims Avenue. The massive 3,000ha Tianjin Eco-City, which is worth several billion ringgit, will be developed in three phases from 2011. Sunway City Bhd (SunCity) has signed a joint-venture agreement with Sino-Singapore Tianjin Eco-City Investment and Development Co Ltd (SSTEC) to undertake a RM2.5 billion mixed development in Tianjin, China. However, implementation of the project is subject to a feasibility study. SunCity will develop part of the second phase, covering 41ha, with SSTEC. Sunway Group founder and chairman Tan Sri Dr Jeffrey Cheah said that a joint-venture company, led by SunCity, will be set up after the study is completed. The joint-venture company will build bungalows, villas, semi-detached and terraced houses, high-rise residences and commercial properties, including a shopping mall, on less than 20ha. The rest will be kept green. "We are very confident of this project as it is driven by the Chinese and Singaporean government. SSTEC has attracted the largest and best eco-developers in Asia. This proves the project will happen," said Cheah. He was speaking at a press conference yesterday in Bandar Sunway, Selangor, after inking an agreement with SSTEC to carry out the study and market research, and to come up with a sustainable business model for the project within six months. The developers include China's Shimao Group, Japan's Mitsui Fudosan and Taiwan's Farglory Group, which are involved in the first phase of Tianjin Eco-City. "The main thing is to get the right product so the development can run. The next six months is very crucial. We will plan the 41ha properly to come up with a sustainable, workable and viable development," Cheah said. He added that the project will be funded by equity and bridging finance. Part of the funding will also come from a real estate investment trust (REIT) that SunCity is planning to launch in the next one to two years. SSTEC is the master developer of Tianjin Eco-City. It is a 50:50 joint venture between the Chinese consortium led by Tianjin TEDA Investment Holding Co Ltd and the Singapore consortium led by the Keppel group. Tianjin Eco-City is a landmark bilateral project between China and Singapore with private-sector investment and development. When completed, it will have 26,500 households. SSTEC chief executive officer Goh Chye Boon said it was targeting reputable developers from the project to work with when it embarks on new projects in China. "We want to make sure Tianjin Eco-City is sustainable so we can replicate the development in other parts of China. 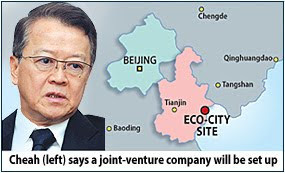 We are looking for bigger land now," Goh said, adding that SunCity may be given more jobs in Tianjin Eco-City. He said SunCity may also be roped in to work on other projects that the Chinese and Singaporean consortiums are eyeing in China, Indonesia, Vietnam and India. Sunway City Bhd, a Malaysian property developer, rose to a nine-day high after the company said it plans to collaborate with a Chinese company and a Singapore consortium led by Keppel Group to develop a housing and office project in China. The stock climbed 1.3 per cent to RM3.23 at 9:11 am local time in Kuala Lumpur, set for the highest level since October 19. SUBANG JAYA: The Empire Shopping Gallery, which is expected to be fully operational by the first quarter next year, has already leased out 70% of its lettable units. Owned by Couture Homes Sdn Bhd, the five-level lifestyle neighbourhood shopping gallery has a gross built-up area of 600,000 sq ft with 180 stores. It will offer among others, international and domestic brands, food and beverage outlets, and a gourmet supermarket. Couture Homes managing director Datuk Sean Ng said Empire Shopping Gallery was designed to be a lifestyle and contemporary centre that Subang Jaya would be proud to call its own. “We believe we are the only shopping gallery to dedicate an entire floor to children called the Empire Junior Floor,” he said in a statement. He added that the gallery’s primary focus was edutainment, featuring a centre for the learning arts such as ballet, drama, linguistics, information technology and a host of creative arts in addition to toy stores. The company yesterday help a topping-off ceremony to symbolise the completion of the the gallery’s construction. The Empire Shopping Gallery is part of the freehold Empire Subang commercial development that comprises three additional elements – Empire SoHo, Empire Tower and a boutique hotel. Empire SoHo offers 210 home offices. The Empire Tower is a 12-storey office block while the 13-storey Empire Hotel is destined to be the latest stylish gateway for business and leisure travellers. Couture is a member of the Mammoth Empire Group of Companies. KUALA LUMPUR: SP SETIA BHD's subsidiary is teaming up with China's Hangzhou Ju Shen Construction Engineering Ltd to undertake a mixed real property development project in XiaoShan, Hangzhou. It said on Wednesday, Oct 28 its subsidiary, Setia (Hangzhou) Development Co. Ltd and Hangzhou Ju Shen would set up a limited liability joint-venture company to undertake the project on 25 acres of land there, of which five acres would initially be developed under the first phase. "The management of SP Setia is of the view that the JV Contract will further drive the Group on its way towards achieving its overseas expansion ambitions supported by the success and awareness generated through its maiden international, integrated commercial and luxury high-rise development projects," it said. SP Setia said the JV contract also provided an important opportunity for the group to start off with a small presence in the fast-growing Hangzhou property market and progress from there to the larger China market. In view of the above, the JV contract augurs well for the company and is expected to contribute positively to the future earnings and cash flow of SP Setia. PETALING JAYA: The Government’s proposal to reimpose the real property gains tax (RPGT) may ensure a more balanced property market in the long run but industry players see it as counter-productive to the ongoing efforts to stimulate investments in the property sector. Under Budget 2010, the RPGT of 5% would be imposed from Jan 1 on gains from the disposal of real property irrespective of the holding period and category of owner. Industry players and analysts see the reinstatement of the RPGT as premature when the property market is just recovering from the global financial crisis. However, they hope the move to allow Employees Provident Fund (EPF) contributors to utilise their current and future savings in Account 2 for home purchase would compensate for the imposition of the RPGT. 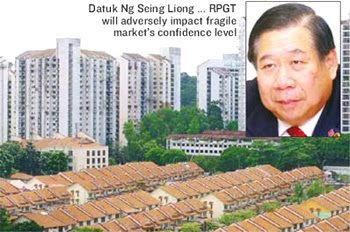 Real Estate and Housing Developers Association (Rehda) president Datuk Ng Seing Liong said re-instating the RPGT after a brief exemption period of less than three years would adversely impact the already fragile market’s confidence level among investors, both local and foreign. “Worse, the move is also a reinforcement of Malaysia’s infamous ‘flip-flopping’ property investment policies,” Ng added in a statement yesterday. He urged the Government to review the RPGT proposal and carefully study the cost-benefit analysis of such a move before its implementation. Ng said the owners might want to sell their houses to upgrade to better properties or to relocate. HwangDBS Vickers Research said in a note yesterday the property tax was a “negative surprise” and would “dampen the velocity of transactions”. Although the real property sector had enjoyed some measure of recovery in the past three to six months, the research house said transactions remained subdued and many developers had yet to undertake new project launches. “The RPGT of 5%, although low, could make developers pause and gauge market conditions before taking the plunge, which would push back their earnings recovery. Also, the re-imposition of RPGT may stir fears of more RPGT increases in future years, which could have a compounding dampening effect on the sector,” CIMB Research added. “This may dampen property buyers’ sentiment and may deter speculative activities to a certain extent,” it said in a note yesterday. According to Mah Sing Group Bhd group managing director Tan Sri Leong Hoy Kum, the waiver of RPGT since April 2007 had been effective in boosting sentiment and increasing domestic and foreign demand in the local property market as it had lowered the cost of property sales. As Mah Sing catered mainly to first-time home buyers, owner-occupiers and the upgraders’ market, Leong said it would not bear the brunt of the impact of the RPGT. Liew said at 5%, the RPGT would not significantly impact decisions to buy or sell properties, regardless of the holding period. “RPGT is a tax on gains derived and not proceeds received from the disposal of real property. The reimposition of the tax by the Government at this time indicates their confidence in the health of the sector and also that there are decent gains to be made from property transactions,” Liew added. Sunway City Bhd managing director of property development Ngian Siew Siong concurred that a tax rate of 5% “is very minimal and should not be a deterrent to buyers and investors.” “Malaysia’s property prices are still comparatively lower than those in other regional countries,” he said. However, Ngian wants gains from properties acquired more than five years ago to be exempted from tax, pointing out that those who kept their properties for over five years comprised mainly owner-occupiers and long-term investors who did not speculate in the property market. “After all, the RPGT was introduced to curb speculative buying and as such, owner-occupiers and non-speculators should not be burdened by it,” he said. Q. I have owned my house for 10 years. I am thinking of selling it next year, or maybe consider giving it as a gift to my son. I am a Malaysian citizen. Will I need to pay real property gains tax (RPGT)? At what rate? Will there be any special exemptions available to me? A. If you sell the property, the rate of RPGT applicable would be 5% of the chargeable gain as per the intention of the reintroduction of RPGT. As an individual, under the Budget proposals, you will be entitled to an exemption of RM10,000 (previously RM5,000) or 10% of the chargeable gain, whichever is the higher. You are entitled to a once in a lifetime exemption from RPGT for disposal of a private residential property. If you give the house to your son as a gift, you will be exempted from tax, as it is proposed that all gifts of real property between parent and child, husband and wife, grandparent and grandchild would be exempt from tax. I took a loan to finance the purchase of a piece of property a few years ago. If I sell my property, can I incorporate the interest that I have been paying on the loan as part of the purchase price of the property when calculating the RPGT liability? Based on the proposals in the Finance Bill 2009, you will no longer be able to include any interest incurred on capital employed to acquire the asset as part of the acquisition price of your property in calculating the RPGT liability. I sold a piece of property in January 2007, which at the time, resulted in a loss to me for RPGT purposes. However, the government then announced the RPGT exemption from April 1, 2007 onwards. As a result, I have not been able to utilise the tax relief from that RPGT loss ever since. Can I still use that tax relief when RPGT is imposed again from next year? Based on the transitional provisions proposed in the Finance Bill 2010, if you were entitled to a tax relief for RPGT purposes and have not utilised that tax relief at March 31, 2007, you will be entitled to claim that relief as a deduction against any RPGT assessed in the first year of assessment subsequent to the year of assessment 2009, and so on for subsequent years of assessment, until the whole amount of the relief is fully allowed as a deduction. The principal activity of my company is the manufacture of food products. The board of directors decided to register trademarks of some of our products with the Domestic Trade and Consumer Affairs Ministry. I understand that the recent budget announcement proposes that the expenses incurred on the registration of trademarks in Malaysia will be allowed as tax deduction for purposes of income tax computation. Can you please confirm? The proposed tax deduction on the expenses incurred on the registration of trademarks will only apply to companies which have a paid-up capital in respect of ordinary shares of RM2.5mil and less at the beginning of the taxable period. Note that the company should not be related to a company which has a paid-up capital in respect of ordinary shares of more that RM2.5mil at the beginning of the taxable period. In addition, the company should not have full-time employees exceeding 150 persons nor annual sales turnover exceeding RM25mil respectively. The registration expenses include fees or payments made to trademark agents registered under the Trade Marks Act 1976. This deduction is essentially targeted for small and medium enterprises. This proposal is effective from Year of Assessment 2010 to 2014. To expand the use of green technology, the government launched the Green Building Index (GBI) on May 21, 2009. Can you elaborate on what GBI pertains to and some of the tax incentives available. GBI was developed by Pertubuhan Akitek Malaysia and the Association of Consulting Engineers Malaysia. Under the GBI assessment framework, points will be awarded for achieving and incorporating environment-friendly features which are above current industry practice. Two different sets of GBIs have been developed for both commercial and residential properties. As a measure to encourage the construction of buildings using green technology, it is proposed that the owners of buildings awarded the GBI certificate be given exemption equivalent to 100% of the additional capital expenditure incurred to obtain the GBI certificate. This incentive is applicable on new buildings and upgrading of existing buildings. The proposal is effective for buildings awarded with GBI certificate from Oct 24, 2009 until Dec 31, 2014. Further details on GBI can be viewed at http://www.greenbuildingindex.org. IJM Land Bhd, the country's fifth biggest property developer, fell 2 per cent to RM2.44, while Sunrise Bhd slid 4.6 per cent to RM2.28. Eastern & Oriental Bhd shed 6.5 per cent to RM1.15. KUALA LUMPUR: The proposed flat tax rate of 5% on gains from any property transacted, irrespective of the number of years it is held before being sold, is expected to create a spike in transactions of property held for five years and more, said a tax consultant. The consultant said that in a bid to minimise the effects from the tax that was proposed in the Budget 2010, the number of property transactions is expected to significantly increase over the next few weeks leading up to the end of the year. The proposed tax is to take effect from Jan 1, 2010. In tandem with developments that are expected to negatively impact the property sector, stock prices of property counters on Bursa Malaysia have declined. The property index fell 15.12 points to 805.26 with IGB Bhd and IJM Land Bhd being the top losers. IGB, which is the ultimate parent company of MegaMall and Properties surrounding it in Mid-Valley, shed 14 sen to close to RM2. IJM Land, which is fast gaining ground as the next “S P Setia”, lost 12 sen to close at RM2.37. The tax consultant said that medium- and long-term property investors and companies holding property for more than five years would dispose the property within the next few weeks. The consultant said that since 1976 when the real property gains tax (RPGT) was introduced, property transacted after five years of ownership were not taxed. “But the new proposal calls for tax on all property transacted irrespective of the number of years it is held. This will disadvantage those holding properties for more than five years and that have seen an appreciation in its value,” said the consultant. He cites an example of a person or company that has held a property for more than five years and looking at a gain of RM1 million. “After Jan 1 next year, the tax would be equivalent to RM50,000 for a gain of RM1 million. If the property is transferred before January 2010 for say RM1 million and sold a year or two later for about RM1.1 million, the tax will only be on the gain of RM100,000 which is RM5,000,” said the consultant. However not all are of the view that the ruling would spark a slew of transactions by people owning property for more than five years. KGV-Lambert Smith Hampton executive director Samuel Tan said that it was too early to tell whether there would be a spike in property listings or transaction. “But I foresee people becoming more careful when it comes to purchasing and selling a property, thus slowing down the momentum we are just starting to gain which is detrimental to our marke,” he said. However, nearly all players in the property sector agree that the proposed tax was not fair to long-term holders of property. According to YY Lau, a director of YY Property Solutions General, the people who are being penalised are those who own properties for many years. He also said that it was not clear as to why the RPGT would be imposed. Raine & Horne International Zaki and Partners Sdn Bhd executive director Lim Lian Hong expected the proposed tax to be an immediate shocker but in the long run, it won’t be a big deal. Under the 2010 Budget, the government proposed a fixed tax rate of 5 per cent on gains from the disposal of real properties effective January 1 next year. However, based on the Finance Bill, disposals within two years of acquisition will be taxed 30 per cent, 20 per cent in the third year and 15 per cent in the fourth year, while disposals within five years and beyond will still be subjected to 5 per cent. "As far as the Act is concerned, the rate is still there, which is 5 to 30 per cent. Exemption order has yet to be gazetted but it is coming out very soon, maybe around this week," the Finance Ministry's Under Secretary, Tax Analysis Division, Siti Halimah Ismail, said in Kuala Lumpur yesterday. She was speaking to reporters after the 2010 Post Budget Dialogue, organised by the Malaysian Economic Association and University of Malaya's Faculty of Economics and Administration, and supported by Standard Chartered Bank Malaysia Bhd. PROPERTY developer SP Setia Bhd said its wholly-owned unit KL Eco City Sdn Bhd and Datuk Bandar Kuala Lumpur (DBKL) have agreed to extend the period for the execution of a privatisation agreement up to February 20 2010. Both the parties were supposed to execute the agreement within two years from the date of a memorandum of understanding (MOU) entered on August 21 2007. Under the MOU, SP Setia has agreed to pay, through DBKL, compensation to a maximum of 600 squatter families amounting to RM3.6 million for the land near Mid Valley in KL, to be developed into a mixed residential and commercial development as a privatisation joint-venture project. SP SETIA Bhd, through its subsidiary, Setia Lai Thieu Ltd, has signed an agreement with Investment and Industrial Development Corp for the assignment of 27 acres of land worth US$16.26 million (RM54.96 million) in Lai Thieu Town, Vietnam. The land will be developed into a US$250 million (RM845 million) mixed-use project, which is expected to take six years to complete. The development will include shop houses, commercial centres, a club house and apartments. Lai Thieu Town is located 16km north of Ho Chi Minh City and an hour’s drive from Tan Son Nhat International Airport. This will be SP Setia’s third project in Vietnam. PETALING JAYA: SP Setia Bhd plans a mixed property project with gross development value of US$250mil in Vietnam. SP Setia said its subsidiary, Setia Lai Thieu Ltd, had entered into an in-principle agreement with Investment and Industrial Development Corp (Becamex) for an independent mixed-use real estate project in Binh Duong Province. “It shall entail a mixed development of about 1,700 units comprising shophouses, terrace houses, semi-detached houses, commercial centres, a clubhouse and apartments,” it said in a filing with Bursa Malaysia. The project would be on 26.79 acres and would be transferred from Becamex to a newly-formed company for US$16.26mil, it said. “The US$16.26mil was arrived at by aggregating all the costs and expenses for compensation and payment of all land-related fees,” it added. KUALA LUMPUR: IJM Land Bhd led real estate stocks lower and builders fell after Prime Minister Datuk Seri Najib Tun Razak imposed a capital gains tax on property and the Government cut development spending. IJM Land, Malaysia’s fifth-biggest developer, slid 5% to RM2.37 while IGB Corp lost 6.5% to RM2. The property tax was a “negative surprise” and would “dampen the velocity of transactions,” HwangDBS Vickers Research Sdn Bhd said in a report. The Government aims to bolster revenue and cut spending to help trim a budget deficit to 5.6% of gross domestic product next year from a 22-year high of 7.4% in 2009. Malaysia planned a 5% capital gains tax on property from January to help broaden the base of revenue collection, Najib said last Friday. Development expenditure will be reduced by 4.4% to RM51.2bil next year. Gamuda Bhd, Malaysia’s second-biggest construction company, lost 1.4% to RM3.30, set for the biggest decline since Oct 9. IJM Corp Bhd dropped 1.2% to RM4.86. Sunway City Bhd and Sunrise Bhd had their stock ratings cut to “hold” from “buy” by HwangDBS, which also lowered the target prices of SP Setia Bhd, DNP Holdings Bhd and Eastern & Oriental Bhd. Shares in Sunway were unchanged while Sunrise fell 4.6% to RM2.28. SP Setia lost 1.3% to RM3.81, headed for the lowest level since July 13. DNP sank 6.6% to RM1.41 and Eastern & Oriental declined 6.5% to RM1.15. “The Government needs to ensure that the Malaysian tax system is equitable and able to generate revenue for development purposes,” Najib said in his budget speech. Property tax exemptions for families would remain, he said. Previously, the capital gains tax on property was 30% within the first two years, falling to 5% by the fifth year. For foreigners, the old tax started at 30% for the first five years, dropping to 5% in the sixth and subsequent years. Neighbouring Singapore said in August it wouldn’t proceed with an earlier plan to impose a tax on some property transactions after receiving negative public feedback. The city-state had planned to tax individuals who sold more than one property within a four-year period to deter speculation. The Master Builders Association Malaysia (MBAM) will hold the second Malaysian Construction Summit on November 10 at the Sunway Pyramid Convention Centre. Industry players and government officials will gather at the one-day event to talk about issues and produce some practical solutions for the industry. For further details please contact Zharraine Chang, senior executive officer at 03-7984-8636 or email mbam02@mbam.org.my. STEEL makers and select property stocks suffering further selling pressure after the government slashed development spending goal for 2010. AMONG builders, Gamuda was down 0.3 per cent, WCT dipped 0.37 per cent and IJM, the country’s largest construction group by assets, fell 0.62 per cent. Steel maker Ann Joo slid 2.65 per cent and Perwaja, the country’s largest steel firm by output, was unchanged after a weak opening. Prime Minister Datuk Seri Najib Razak last week said development spending will be cut by 4.5 per cent next year as the government moves to contain ballooning budget deficit following this year’s big stimulus plans.